Once upon a time, Matt was very tall.Â Well, he is still very tall, two inches taller now actually, but he was very tall at the moment in time we are discussing.Â So, once upon a time, Matt was six foot eight and a high school freshman who moved to a new town.Â The basketball coach got very excited.Â Very excited.Â Matt was immediately placed upon the basketball team.Â Being that it was the middle of the year, the worst player was removed from the basketball team in order to make room for him. 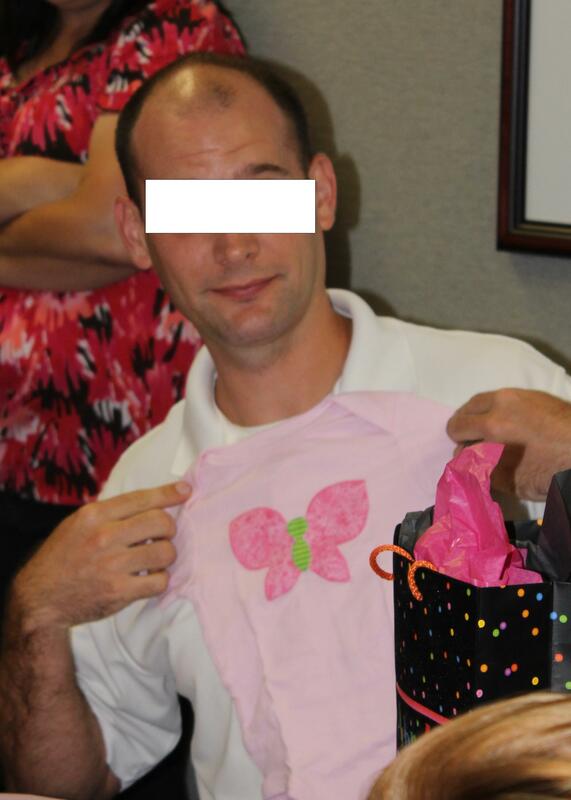 Yesterday, my little sister went to a baby shower at her office.Â The shower recipient is the dad.Â My sister ordered two onesies from my shop (an initial onesie and a Lucy butterfly onesie) as gifts, since she is fairly good friends with this guy.Â My business card was in the package with the gift. Because I am married to Matt and Matt took this guy’s place on the basketball team. My sister tells me that this guy is still mad and brings it up pretty much every time my sister talks about me or Matt. I mean, really?Â Fifteen years ago?Â Married with a good job and a baby on the way and you are still holding this grudge? And they all lived happily ever after… well, happily except for their grudge.